This post is sponsored on behalf of Swanson. All opinions are my own. Thank you for supporting the brands that I love and that help make Jelly Toast possible. Thanksgiving is just days away. DAYS, my friends. Don’t worry, don’t worry. Me bringing that up is not meant to worry you. It’s just me trying to convey how excited I am to spend the day watching the Thanksgiving parade and cooking up some of my most favorite food of the year. My family’s Thanksgiving menu stays pretty consistent from year-to-year. My mom makes a fantastic turkey, my sister-in-law makes her insanely good sweet potatoes souflle with a pecan topping, and my grandma makes pumpkin pie and apple crisp. I am often in charge of the mashed potatoes (this year it will likely be my roasted garlic herb cream cheese mashed potatoes), the cranberry relish, and of course, my sausage filling. The sausage filling recipe is a staple in our house and was handed down to me from my sweet Mother-in-Law when we got married ten years ago. One of the things that I love about this recipe is that it is almost a meal in itself. It’s packed full of sausage, onions, celery, garlic, and bread cubes. It will definitely fill you up. No wonder it’s called Sausage Filling. 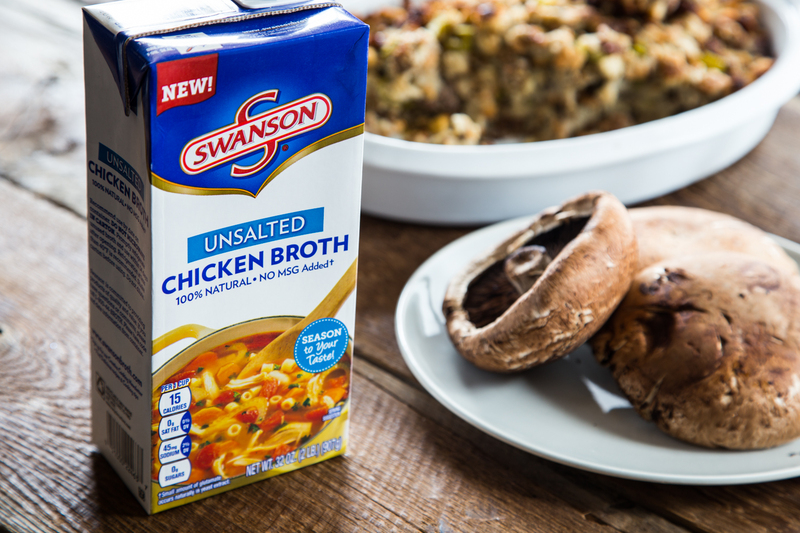 The sausage filling recipe calls for 2-3 cups of broth and this year I grabbed up some Swanson Unsalted Chicken Broth. There is quite a bit of salt added to the recipe with the sausage and the Herb Seasoned Pepperidge Farm Bread Cubes (which is what was strictly called for in the recipe given to me) that I love the idea of having control over the amount of seasoning in the final dish by using the unsalted broth. For these Sausage Stuffed Portabella Mushrooms, I used three cups of leftover sausage filling and remoistened it with about a half a cup of Swanson Unsalted Chicken Broth. This allowed me to bake the stuffing in mushroom caps without compromising the texture of the stuffing and drying it out. I enjoy a slightly drier stuffing, but I still need a bit of moisture to allow the flavors of the sausage and garlic to shine. 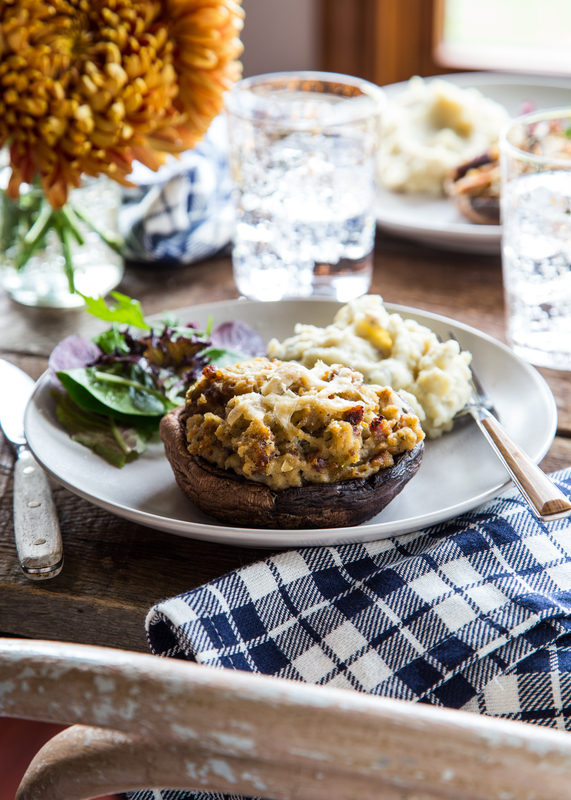 This is a great way to reinvent your Thanksgiving stuffing leftovers! It’s the one time of year that most people are actually excited to eat leftovers, so let’s make the most of them, right? 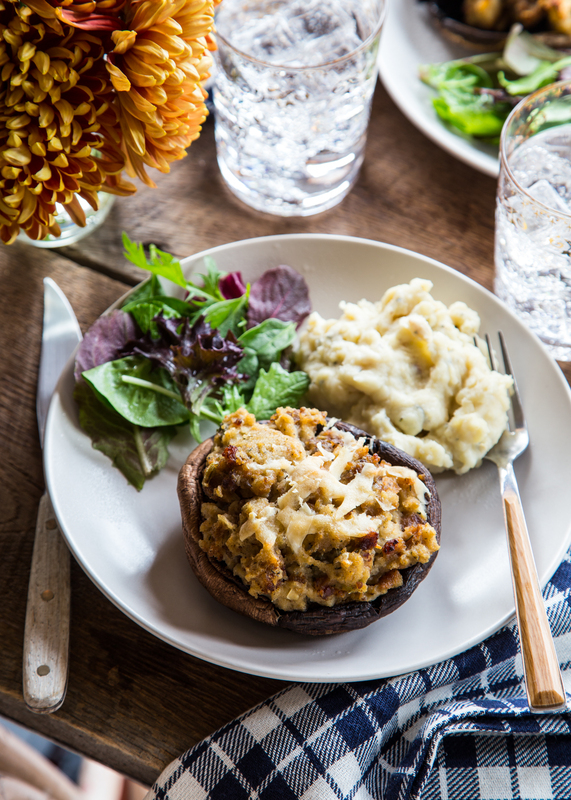 Bake up a batch of these hearty Sausage Stuffed Portabella Mushrooms and your family will be one happy crowd. Preheat oven to 375°F. Line a baking sheet with a non-stick mat or parchment paper. Place mushroom cups upside-down on the prepared baking sheet and set aside. 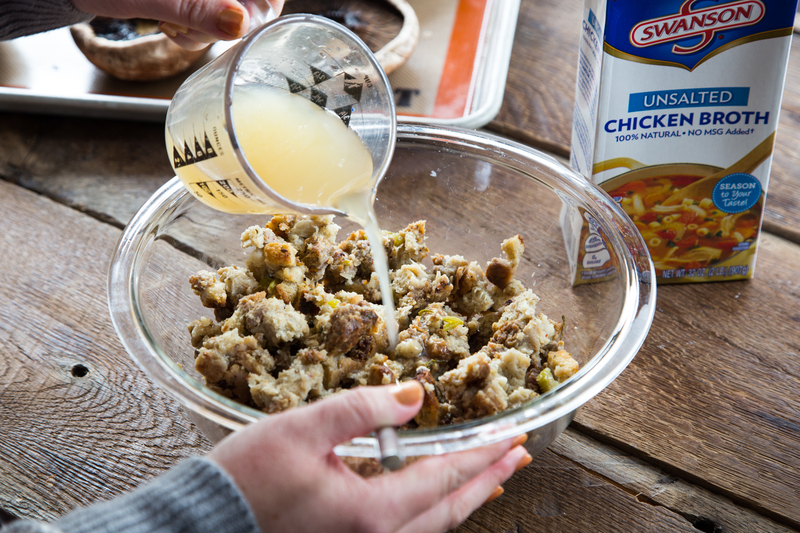 In a large bowl gently mix together stuffing and broth until broth is absorbed and stuffing is nicely moistened. 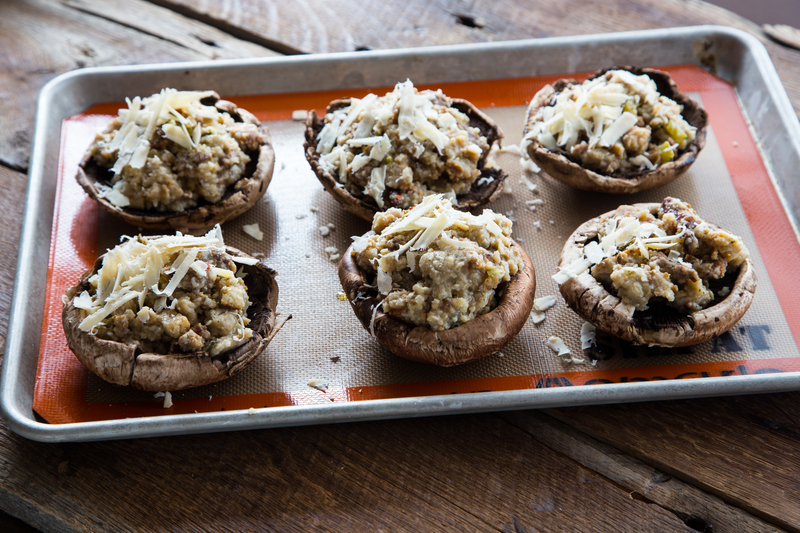 Add 1/2 cup of stuffing to each mushroom cap and divide parmesan cheese over the tops. 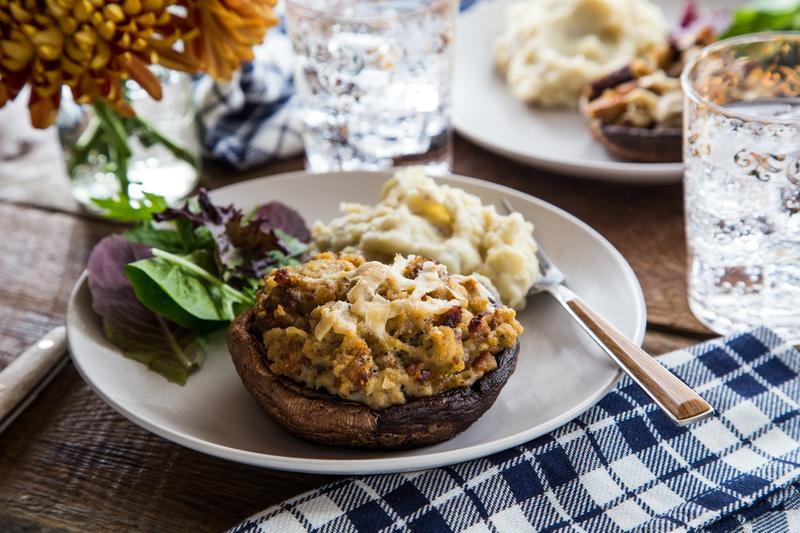 Bake stuffed mushrooms for 25-30 minutes or until mushrooms are tender and stuffing is heated through. Serve and enjoy! These are really some fabulous portabella mushrooms! Seriously the leftover recipes this year look better than the actual Thanksgiving recipes. I just want it to be Friday already! Have fun with your family tomorrow! Thank you, Linda! I totally agree about the leftovers, they get me every year!